First lady Melania Trump traveled to Tucson, Arizona Thursday to make her second visit in a week to a detention facility holding undocumented immigrants arrested at the southern border. "This facility is about two hours away from the actual U.S. border, but is the first place individuals (parents and children together) are brought immediately after detention at the border," the first lady's communications director Stephanie Grisham said Thursday, according to a pool report. "At the facility, she will participate in a roundtable with U.S. Marshals, U.S. Border Patrol Agents, and local ranchers who will share their stories about what they have seen across the border." The first lady's office revealed Tuesday that she would be making another visit to a detention facility as the administration continues to face questions over the status of the more than 2,000 children separated from their parents due to the president's 'zero tolerance' policy. Grisham told reporters that the first lady "shares her opinions and thoughts about family unification with the president directly and that he supported and urged her to make today’s trip." First lady Melania Trump boards her plane for travel to Tucson, AZ, from Joint Base Andrews in Maryland, June 28, 2018. On Tuesday, a federal judge in California ordered a temporary halt to the separation of families at the border and ruled that children taken from their parents must be reunited within 30 days. The court also prohibited, absent a waiver, the deportation of parents without their children, and it said that in the future children can only be separated from a parent if that parent poses a threat to the child. The first lady's visit last week drew significant controversy regarding her choice of a jacket that included a graphic on her back reading, "I REALLY DON'T CARE, DO U?" Trump's office said in a statement that the jacket was in no way intended as symbolic or sending a message, but that claim was immediately undermined by a tweet from President Trump who reacted to the mounting criticism with a tweet. For Thursday's visit, Melania Trump wore white linen pants, a fitted black top and white sneakers, according to pool reports. She was wearing Christian Louboutin flats – and no jacket – when she left Joint Base Andrews outside Washington earlier Thursday. In the roundtable portion of her visit with U.S. Marshals, border patrol agents and local ranchers, the participants mostly focused on the daily difficulties with handling enforcement and apprehensions and less on the issue of family separations that occurred under the administration’s "zero tolerance" policy. Chief Patrol Agent Rodolfo Karisch for the TCA Border Patrol sought to push back on the characterization of DHS agents as heartless in carrying out arrests and detentions on the border. He said the Tucson unit apprehends on average “about 150 immigration violators per day,” and they’ve already surpassed last year’s apprehensions total of 38,000. 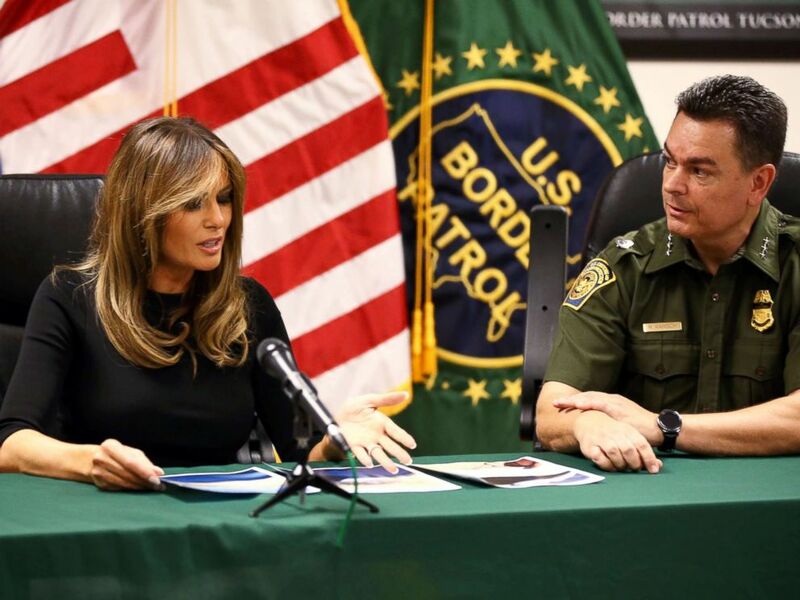 First lady Melania Trump looks at photos of an abandoned 6-year-old Costa Rican boy found in the desert recently during visit to the Tucson Sector office of the U.S. Customs and Border Protection. Mike Humphries, who runs the Office of Field Operations, said that “just a couple” of families were separated under the Tucson border patrol’s watch and insisted “they are very short separations.” He said the brunt of children who are actually under the TCA Border Patrol’s care are unaccompanied minors. The first lady then asked how often they see children crossing alone without an adult, and Humphries said there have been 1,100 unaccompanied minors who have entered through Arizona ports of entry since Oct. 1, 2017. In a separate trip to a processing facility where officials say migrants are held short-term - up to 72 hours - the first lady toured what reporters said was a cinderblock room with multiple cells - one labeled “family unit” and another “juveniles”. The rooms had jail-cell-like qualities - benches and a toilet, large glass windows, reports said. Ledges on the cell walls were lined with paper cups filled with individual, disposable wet towels. The doors of the rooms were open, which the agents said is always the case for juveniles. There is a cart outside of the rooms filled with snacks - applesauce, cheese crackers, and juice boxes which were told are accessible 24/7, reports said. Six young boys sat on small chairs outside of the rooms, watching the cartoon movie "Ferdinand" which was playing in Spanish and with Spanish subtitles on a tv mounted on the wall. At one point we heard a high pitched cry from the room labeled “family unit”. The White House said the center currently held 10 kids, all males, ages 14 – 17 and a mother with a 3-year-old son – from Guatemala & Honduras. Reporters with the first lady never saw her interact with children and no photos of the children's faces were allowed.